Tower Control, a new game mode, will soon be added to the already available multiplayer modes in Splatoon. This mode will be added to Ranked Battle, which also includes Splat Zones. The objective of Tower Control is to ride a single floating tower into the enemy’s base. Both teams rush toward the tower, which is initially placed in the center of the map, and the tower will start moving automatically once a player climbs aboard. 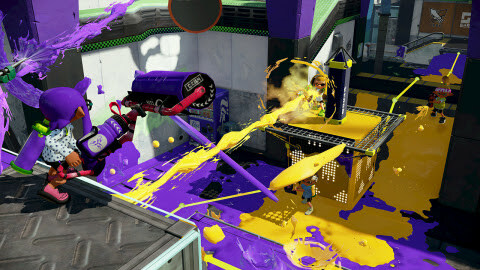 But beware: Riding the tower will increase the chances of being splatted, as every player has his or her target on the tower. Riding the tower alone is pretty tough, encouraging randomly selected teams of players to team up to accomplish their goal. Just like in Ranked Battle and Turf War, players will be rewarded for working together as a team. Surrounding the tower and protecting the player riding the tower, using each stage’s features to gain an advantage, and supporting each other are the keys to victory. Tower Control will be available at 7 p.m. PT on July 1. The Splatoon game also features themed events called Splatfests that let players choose their allegiance in a popular argument and then compete against the opposing side in online battles. The first Splatfest for players across the Americas takes place all day on July 4 and asks players to choose which is better, dogs or cats, one of life’s great debates. Right now, players can already choose their allegiance in-game and receive a special in-game T-shirt showing support for their side. As players battle in Splatfest, they can rank up and earn in-game Super Sea Snails, which can be used to further customize and improve their gear. The winning team at the end of Splatfest will also receive bonus Super Sea Snails. Stay tuned for information about additional Splatfests. Since Splatoon launched exclusively for Wii U on May 29, Nintendo has added a variety of new content, including new maps and weapons. The game will continue to be supported through new downloadable content, including an update in August that has more robust matchmaking options. Follow the Splatoon Tumblr page, http://splatoonus.tumblr.com/, to get the latest information about new content. For more information about Splatoon, visit http://splatoon.nintendo.com.